This document describes SignalFx’s integration with NewRelic. Use this integration to view New Relic metrics in SignalFx. With this integration, you can apply SignalFx’s analytics to New Relic data, use New Relic data in alerts, and enrich your infrastructure data with data about your New Relic-instrumented applications. This integration requires a New Relic account. You must be an administrator of your SignalFx organization to create or modify this integration. Follow New Relic’s instructions to obtain a REST API key for your account. Click the New Integration button. In the field labelled API key, enter the API key that you obtained in step 1, then click Validate. A message appears that says Validated! If a different message appears, contact support@signalfx.com for help. Select a New Relic module to sync to SignalFx (APM, Mobile, or Servers). You will create a sync rule for that module to control which metrics SignalFx will sync from New Relic. Click Add Apps or (for the Servers module) Add Servers. Use typeahead to include at least one filter string, checking results of the filter on the Sample Matches list. Click the blue + button to add a string to the list of filters. (Note: Because the volume of available metrics from New Relic may be large, SignalFx recommends filtering down to just one or a few items to start). When your filter includes all the items you wish to monitor, click Done. (optional) Select metrics and stats to monitor. By default, all are monitored. (optional) Click New Sync Rule and repeat steps 3-5 for other modules. Click Save. The choices you made for each module are saved as individual sync rules. 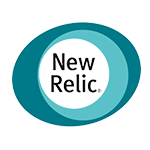 You can later reopen the New Relic integration to add, edit, or delete sync rules. Your New Relic account is now connected and ready to use. Data from New Relic will arrive at SignalFx within minutes. 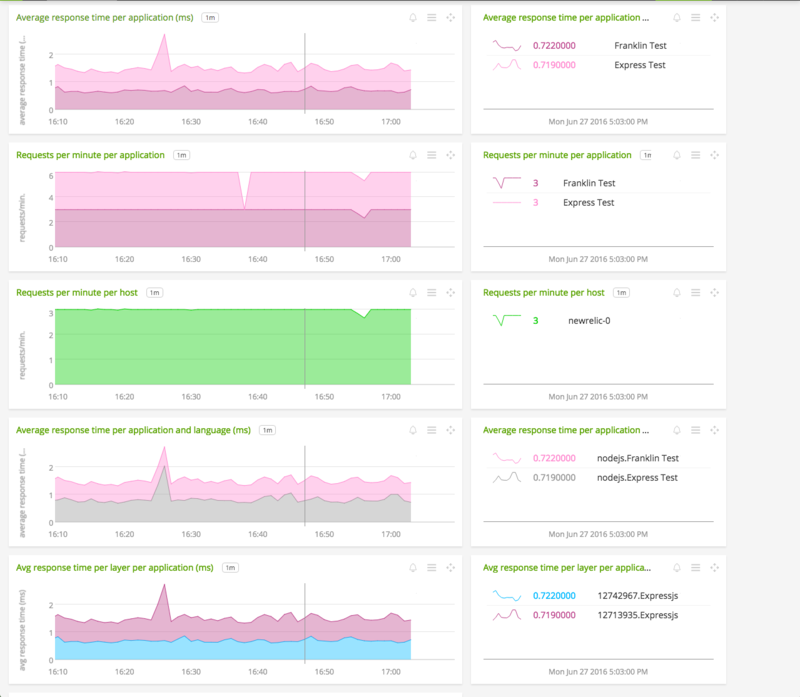 “New Relic Applications Overview” - This shows how to display metrics for multiple New Relic applications at once, like response time and requests per minute. “New Relic APM + collectd infrastructure metrics” - This shows how to display data from New Relic applications data alongside infrastructure metrics from collectd. Note that sometimes, as in this example, the delimiter / appears in the metric name to denote a URL path (/*). SignalFx does not distinguish between / characters used as delimiters, and / characters used in paths. To help you compose charts with New Relic metrics, SignalFx supports two kinds of wildcard searching: regular wildcard mode, and New Relic wildcard mode. Use this when: Youre comparing general data across New Relic applications or accounts, or you need to dynamically filter an entire dashboard. The information that you will filter or aggregate by is captured in dimensions like application (the name of the New Relic application) and host (the hostname of the server hosting a New Relic application). In regular wildcard mode you can use * for wildcarding, and the wildcard applies to the entire metric name. For example, in a regular wildcard query, System/* will return any metric beginning with System/, even if there are subsequent slash characters in their metric names. Use this when: Youre comparing detailed metrics about applications or servers, and can make individual static dashboards about specific applications or servers. You need to filter or aggregate by detailed information thats only available in the metric name, like transaction endpoint or process name. This mode is different from a regular wildcard query using * because it treats the slash / character as a special delimiter. The New Relic wildcard search System/* will only return a metric that has no subsequent slash characters in the name. See the next section for an example. In New Relic mode, you can filter and aggregate metrics based only on the contents of the metric name. To help with this, SignalFx supports on-the-fly dimension aliasing in New Relic mode. Node aliasing allows you to assign names to the slash-delimited components of a metric name, and use the value of each component for aggregation and analytics. When using New Relic mode, you can find aliasing controls in the Y-axis configuration menu in the chart builder. In this example, weve input the search string System/* into the “signal” field in the SignalFx chart builder. In New Relic wildcard mode, System/* does not return the metric System/foo/bar. This is because the search returns only those metrics that have exactly one slash-delimited node after System. System/foo/bar contains two nodes after System: foo and bar, and so does not match the search.